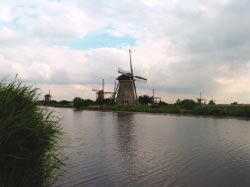 Imagine gliding down the rivers and canals in the Netherlands, taking in the serene landscape of charming cottages and 16th-century windmills without a care in the world. Peaceful. Tranquil. Far from the madding crowds. This is the way to travel Europe. Join Kristyn Lak, Hideaways Staff Writer, as she discovers a new way to vacation in the Netherlands on the M/V Rembrandt, one of INTRAV?s river barges. Everything on the vessel is intimate, from the snug accommodations to the open dining room where you have a chance to meet nearly everyone onboard. Join the other passengers for planned excursions on shore, or explore each charming spot on your own. The choice is yours. INTRAV offers river cruises all over the world, from the Yangtze River in China to the North Pole. Whether it?s luxury travel, adventure travel, or a little bit of both, river cruising is a great way to see the world from a different angle.